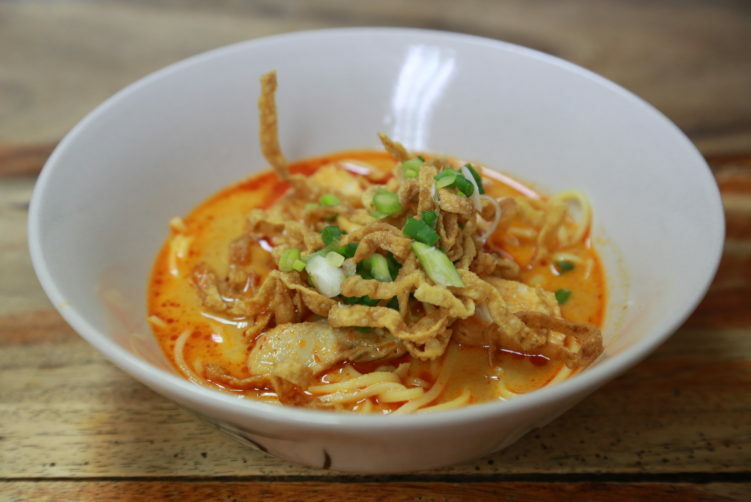 Khao Soi is a northern Thai dish with a strong Burmese influence. Good northern style Khao Soi isn’t an easy find in Bangkok, as most bowls are a bland copy of the Chiang Mai vendors. Khao Soi Silom Soi 3 has been mentioned by Guardian under the heading “Bangkok’s best street food“, so I had some expectations when heading for my Northern fix. I use the slash curry/soup when describing khao soi and there is a reason for it. It’s actually neither of them if you want to be precise. Most of the bowls you find in Bangkok or in the Northern part of Thailand today is close to the Burmese ohn no khao swé, a soup like dish with both deep-fried crispy egg noodles and boiled egg noodles together with pickled mustard greens, lime and shallots. The curry part of khao soi is somewhat similar to the massaman curry but of a thinner consistency as it includes broth and not only coconut milk. Some vendors in Bangkok also add coconut curry cream and not only the milk, making it thicker. Personally, I prefer the soup like and authentic version. What makes khao soi a truly great dish is the combination of crunchy and boiled egg noodles that is coupled with the slightly bitter flavors of shallots and the mustard greens. It just goes perfect with the soup/curry made with chilies and other dry spices. Anyway, to name Khao Soi Silom Soi 3 under the heading Bangkok’s best street food is just absurd. I have great respect for Guardian as a newspaper, but they are mixing things up here. 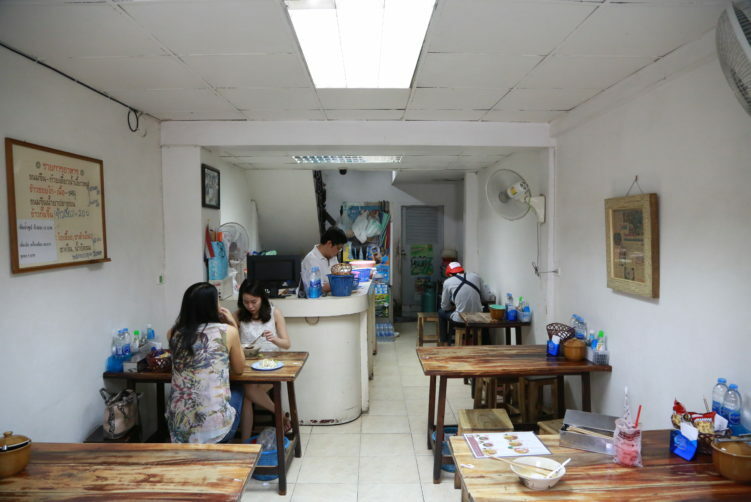 Khao Soi Silom Soi 3 are not even on the list of the 20 best stalls for khao soi in Bangkok. That said, it’s actually a pity to say that as the their khao soi has the potential to be a good one with some adjustments. The khanom jeen (fermented) noodles together with the fried noodles are good, and the bowl also looks lovely. But that’s about where good things stops. So, whats wrong? First of all, they use far to much sugar. Not even pieces of tear strong charlotte onion can mask the sweetness of the khao soi at Silom Soi 3. Even worse, the chicken version consist of some dry pieces of chicken breast. To use chicken breast could have passed if they were able to serve you some juicy bites. It’s a reason why the authentic version uses the drumstick. Both the sugar issue and the protein issue could be a quick fix if they have any aspirations of serving good khao soi gai. I thought for a while that I might have visited them on a bad day, as the potential obviously was there, but after repeating my order on three different occasions the judgement was clear. 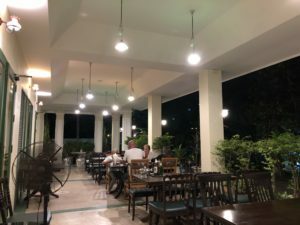 Normally I wouldn’t consider the establishment worthy a review, but as the spot is quite popular with tourists reading the Guardian article, I find it timely to raise the red flag. Will I go back? No, is the short answer, unless someone tell me they have changed. They should really get they’re act together and serve some juicy chicken leg and reduce the amount of sugar used. The potential is there, but they need to put into work. What Khao Soi Silom Soi 3 serves today is pure laziness in my world. 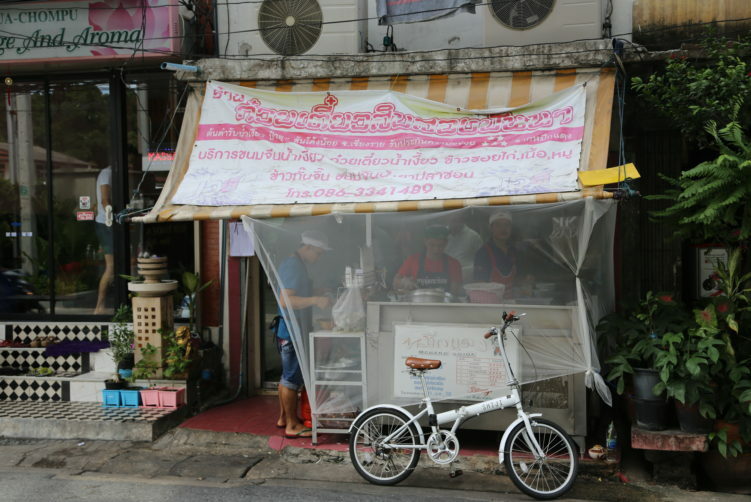 Khao Soi Chiang Mai in Samsen road, Hom Duan in Ekkamai and Hann Khao Soi in Ari soi 1 are examples of very good vendors in the more central parts of Bangkok. Khao Soi Silom Soi 3 also have a few other dishes, like Ka-Nhom Chine Nam Ya (fermented noodles with grounded fish in a spicy coconut curry) and khao soi with beef. I did not taste any of them. How to get there: Take BTS to Sala Daeng and walk from there if you plan to walk in from Silom Road, a 5 minutes walk. An alternative and also slightly shorter rout is to take the BTS to Chong Nonsi and walk Soi Naradhiwas Rajanagarindra 3 as soon as you walk down from the BTS. When you get to Silom Soi 3 were you turn left. Be aware that Soi Naradhiwas Rajanagarindra 3 and Soi Phiphat 2 is the same road with different names in each end. if coming from Convent road you turn into Soi Sphiphat 2 and then right when you get to Silom Soi 3. Khao Soi Silom Soi 3 serve a Khao soi that has potential, but it is slightly too sweet and pieces of chicken breast are dry. See full review in StreetsideBangkok.